Macallan Concept No.1 – A new concept to whisky? The Macallan launches The Macallan Concept No.1, a non-age statement whisky made rather differently from those of its contemporaries. One of Scotch whisky brand The Macallan‘s latest whisky expressions is The Macallan Concept No.1. First unveiled end of last year in Dubai, it was made available in Asia Pacific for the first time earlier this month in DFS at Singapore Changi Airport. At first glance, The Macallan Concept No.1 seems to be all packaging. 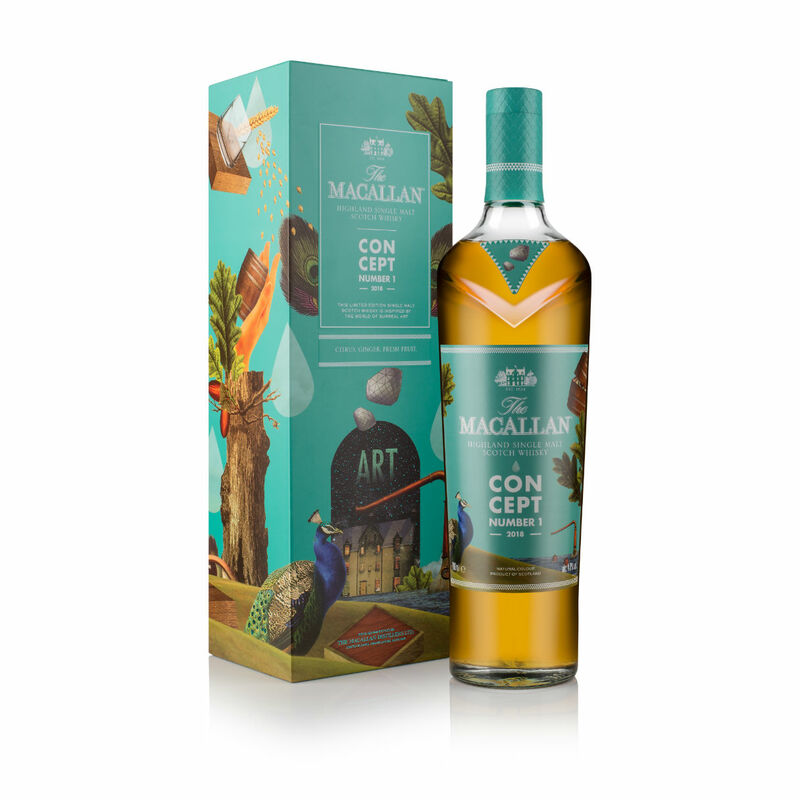 Its enticing teal-blue box and bottle label comes emblazoned with a beautiful surrealistic interpretation of The Macallan’s Six Pillars philosophy. Its bottle shape follows the new modern design for The Macallan’s core range – broad-shouldered, with a distinctive chevron cut in the front. These new bottles even boast anti-counterfeit technology, such as an anti-refill enclosure. But for whisky enthusiasts, what lies within is the real innovation. The Macallan Concept No.1 employs the process of cask finishing, where spirit is first aged in a particular cask type and then transferred into a different cask for further maturation. It’s a common enough process in the Scotch whisky making industry. But where Concept No.1 differs from its contemporaries is that Macallan new-make spirit is first aged in sherry seasoned-casks, before being transferred into ex-bourbon casks for a subsequent amount of time. Which came first – sherry or bourbon? This sounds innocuous, but is actually a very different approach. The reason is simple enough. Aging first in ex-bourbon barrels is common practice in the whisky industry, because ex-bourbon casks are plentiful and inherently cheaper. A good example is Glenmorangie, which explores additional cask maturation of its signature bourbon-aged 12 year old in many different finishes – port cask (Lasanta), sherry cask (Quinta Ruban), or the Bacalta from its Private Edition series further matured in Malmsey Maderia casks. Aging in sherry casks first, even sherry-seasoned ones, is far pricier. So while there are whiskies in the market that are wholly sherry cask matured, we don’t know of any that sees further maturation in ex-bourbon casks. “The Macallan Concept No.1 is whisky reimagined, offering a compelling new sensory experience that rewards with every sip. The innovative process developed to produce this remarkable single malt pays tribute to the visionaries of the surreal art world and reflects our continuous search for excellence,” says Macallan’s master distiller Nick Savage. The Macallan Concept No.1 is now available exclusively in Singapore via DFS duty free stores in Changi International Airport. It will be available in selected airports throughout the rest of Asia Pacific from February 2019 onwards. The recommended retail price is S$170. verdict We’re guessing this is a relatively young whisky. It probably saw some 6-8 years in (fino) sherry seasoned casks, and then less than 18 months in ex-bourbon casks. This’ll come across too light for those who prefer a richer, more full-bodied whisky, but makes a good everyday dram. Will pair well with food. For enthusiasts, buy this as a benchmark for future whiskies that undergo a similar treatment.